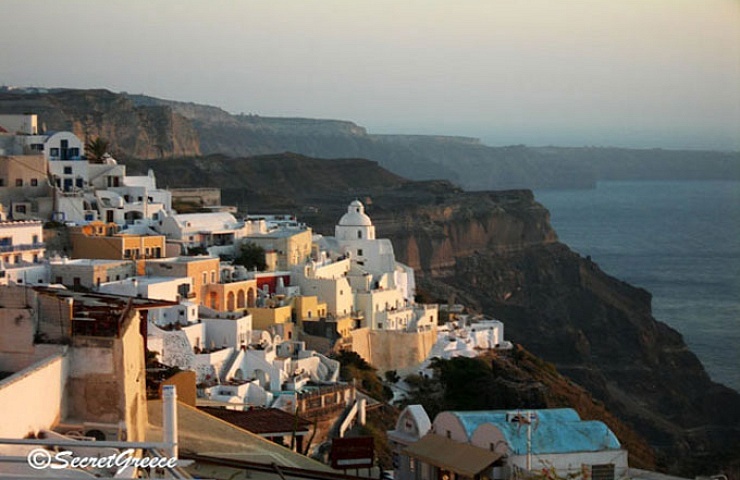 Santorini is one of the most magical destinations in the world. Every top 20 with the best islands in the world includes this unique place! 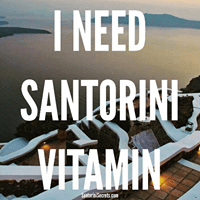 It is absolutely sure that you have seen some photos from Santorini, from Facebook, Twitter and Instagram! 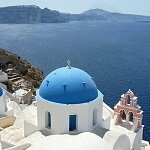 So, for those that are planning to spend some days to this beautiful island, but they want also to taste some more secret and hidden places close to Santorini, you are on the right site! 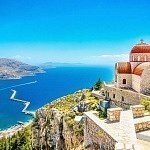 If you want to book tickets online- which I normally prefer if I visit Greek islands during high season, personally, I use Ferryhoper website which is really great if you want to book tickets online easy and accurately! This platform is the best in Greece and you can even use it if you want to create your own island hopping route! The quiet and calm Anafi island offers a nice alternative to busy Santorinii. It has probably better beaches and amazing hiking and trekking choices. In Kalamos there is the largest monolith in the Mediterranean after the rock of Gibraltar! That’s why there is a Greek myth (I would think that for everything in Greece there is a myth behind it!) that from Anafi had emerged the Aegean after Apollo’s orders, in order Argonauts to find a place of rest! But, in Anafi don’t expect glamorous hotels, bars and clubs. It is a wild island for those that look something different. 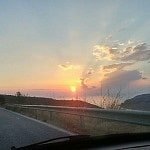 How to get there from Santorini: Anafi is only around 1.5 hour away from Santorini by ferry and especially during summer there are frequent connection. 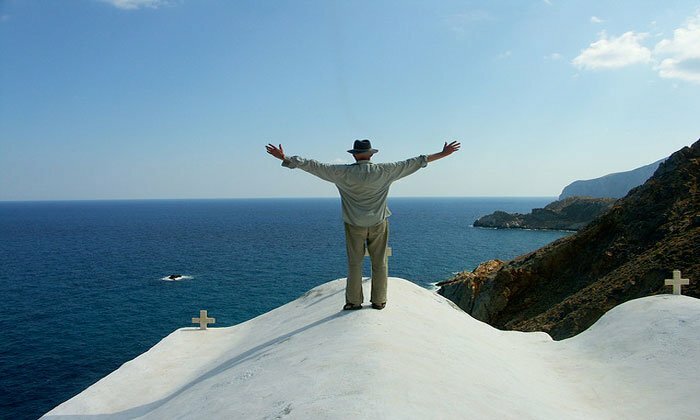 Although in recent years Folegandros has remarkable tourist arrivals, the island has kept its extraordinary beauty! 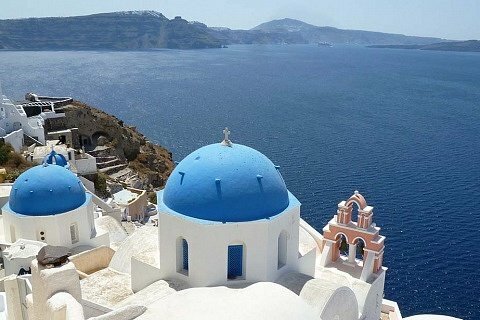 It is 4 hours away from Santorini with ferry and 1.5 away with the speedboat. It combines in harmony the wild Aegean landscape and the traditional architecture with truly hospitable nature of its inhabitants. 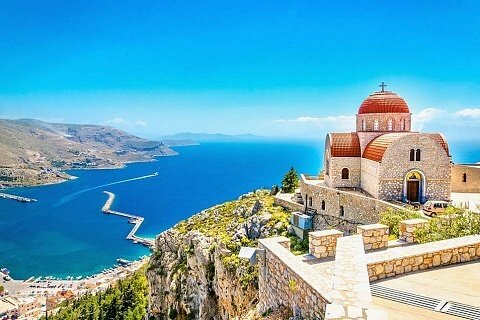 The strong point of Folegandros is its beaches! Beaches with turquoise waters and the sweet shadow of the classic trees and taverns with fresh fish, which will make your stay memorable in Folegandros! 2.5 hours away from Santorini with ferry and almost 1 hour with speedboat Naxos is the best island to be combined with Santorini. 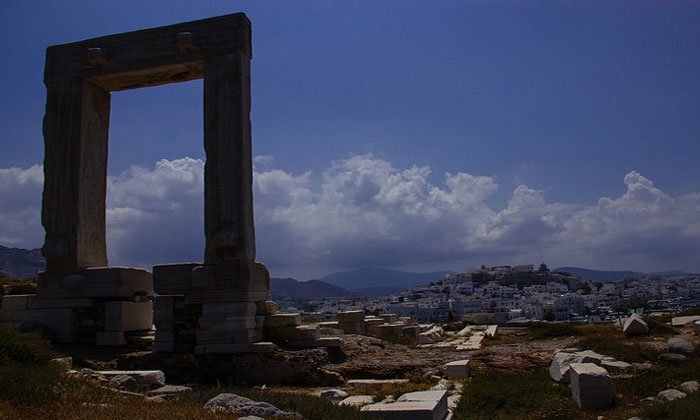 You will meet historic monuments, like the characteristic Portara, which is a massive marble doorway, that stands proudly as the jewel of Naxos and the beautiful castle. Also, this island has unique beaches like Agia Anna, Agios Prokopios, Agios Georgios (very close to Chora), Plaka and the less crodwy Ormos. 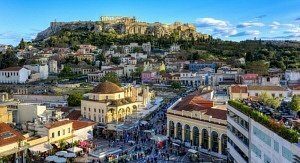 The 5 museums(!) 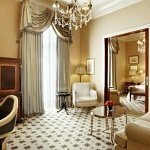 and the traditional houses make this place special! Another stunning village is Keramoti. From here it is visible and the eastern and western coasts of the island. It’s surrounded by lots of greenery and high mountains. 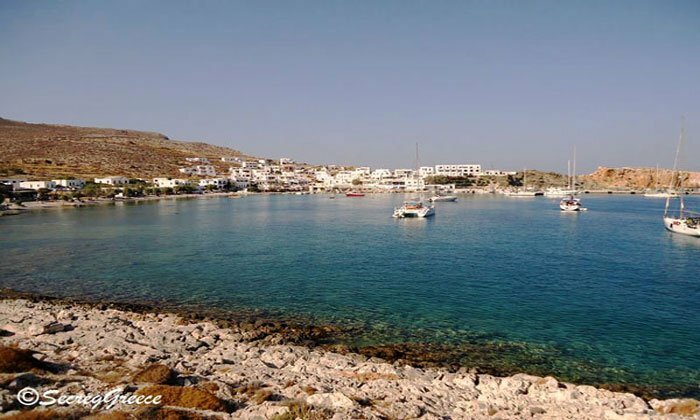 Tip: Close to Keramoti you will see two rivers of Naxos! These two rivers meet at the spot of Dipotamata, and continue their flow together! NewerSir Patrick Leigh Fermor, the man who fell for Mani’s beauty!